As technology continues to advance, cell phones have become less of a luxury and more of a necessity for everyday life. While electronics and the internet certainly make many aspects of life much easier, they also present a constant temptation of distraction from the most mundane parts of the day. Unfortunately, this includes driving. This is especially true for the younger generation. The dangers of distracted driving have been widely studied, and the risks have resulted in new legislation across the country. As fatalities from distracted driving accidents increase, awareness and new laws increase in tandem. Understanding these dangers and educating yourself and your loved ones is your first line of defense against becoming a victim of distracted driving. 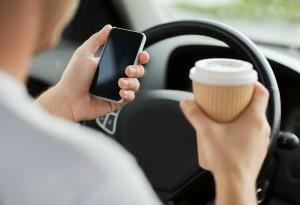 The most well-known example of distracted driving is cell phone use (talking and texting). However, there are many other distractions to consider as well. For example, eating and drinking are also distractions that have been common since the first automobiles. Adjusting music or navigation systems should be avoided at high speeds and in busy traffic situations. Interactions with young children and passengers can also be dangerous distractions, as well as reading directions or road maps while driving. While texting remains the biggest culprit, any activity that takes your attention from the road can cause a serious accident, injury, and even death. In 2013, fatalities involving distracted driver crashes reached 3,154. The same year, 424,000 people were injured due to accidents involving distracted drivers. 27 percent of distracted drivers involved in deadly crashes were in their twenties. 660,000 drivers are using some kind of electronic device behind the wheel at any given moment in the U.S.
10 percent of parents and 20 percent of teens admitted to having prolonged texting interactions while behind the wheel. Although Georgia has not banned the use of cell phones for adult drivers of passenger vehicles, there are restrictions applying specifically to novice drivers under 18 years of age. It is also illegal for school bus drivers to operate any kind of hand-held device while on duty. Because texting requires visual, cognitive, and manual attention, the state considers it exceptionally unsafe. All drivers are prohibited from texting while driving and will be issued a ticket if caught. Distracted driving can result in serious injury or even death. At Van Sant Law, we have extensive experience obtaining compensation for our clients, including those who have been injured in a distracted driving accident. Our attorneys have the skill, knowledge, and dedication to get you the financial help you need and deserve. Attorney David Van Sant has been chosen for the Avvo Client’s Choice Award for his integrity and professionalism. Mr. Van Sant has attained multi-million dollar settlements for clients, and he wants to help you get back on your feet. Our talented, compassionate legal team will be by your side throughout the entire process. Contact Georgia’s top injury firm today for a free consultation.